The goal of the High Lift Prediction Workshop (HLPW) is to assess the current capabilities of computational fluid dynamics (CFD) to numerically predict the high lift flow physics of a swept, medium-to-high-aspect ratio wing aircraft in a landing/take-off configuration. The goal of the Geometry and Mesh Generation Workshop (GMGW) is to assess the current state-of-the-art in geometry preparation and mesh generation for aircraft and spacecraft of interest to AIAA constituents. Both workshops will use the HL-CRM as a benchmark case for their respective goals. Many of the methods and meshes are shared between the mesh types. For the purposes of this article, unstructured will refer to an all-tetrahedra mesh, hybrid will refer to a prism-tetrahedra mesh, hybrid overset will refer to an overset mesh with near-body prism-tetrahedra and off-body Cartesian, and high-order will refer to a hybrid mesh elevated to a non-linear polynomial degree. Geometry preparation was identical for all meshes. Surface meshes and/or methods were identical for all meshes. High-order meshes varied only in the amount of resolution, producing mesh families consisting of medium, coarse, tiny, and extra tiny levels. Volume mesh generation using T-Rex (anisotropic tetrahedral extrusion) was the same for all mesh types but subject to different postprocessing. The hybrid mesh was created by combining the unstructured mesh’s near-wall tetrahedra into prisms. The hybrid overset mesh extracted the near-body cells from the hybrid mesh and added refinement blocks to fill the farfield. 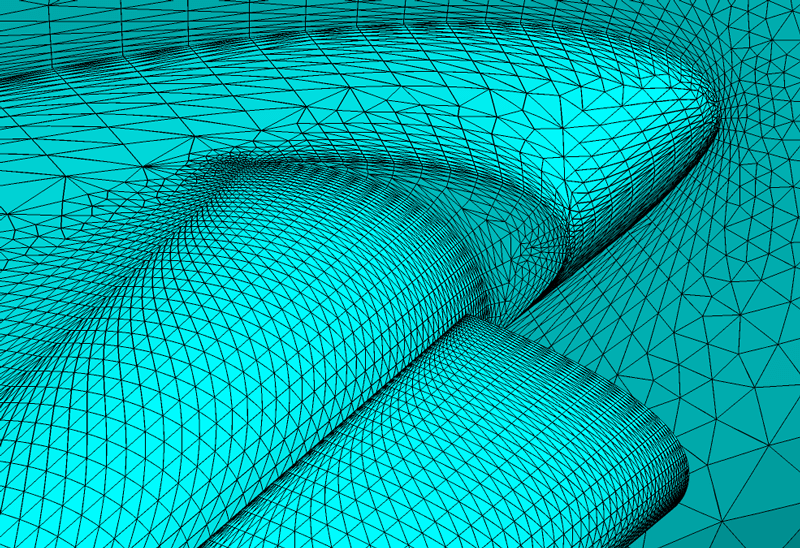 The high-order meshes were generated by curving the linear unstructured and hybrid meshes. Therefore, since so much of the meshing process centers on the hybrid mesh, it will be emphasized in this article. The HL-CRM’s design was based on a high lift configuration that has been used in numerous experimental and numerical simulations. The design was further modified for the specific purposes of HLPW, resulting in the geometry shown in Figure 1. Note that, for the purposes of HLPW, the flap and slat are not attached to the wing and fuselage, and for the purposes of CFD simulation will be assumed to be “flying in formation” with the aircraft. Figure 1: HL-CRM wing-body configuration is shown with modifications to the leading edge slat, wing under slat surface (WUSS), and inboard/outboard flap gap. 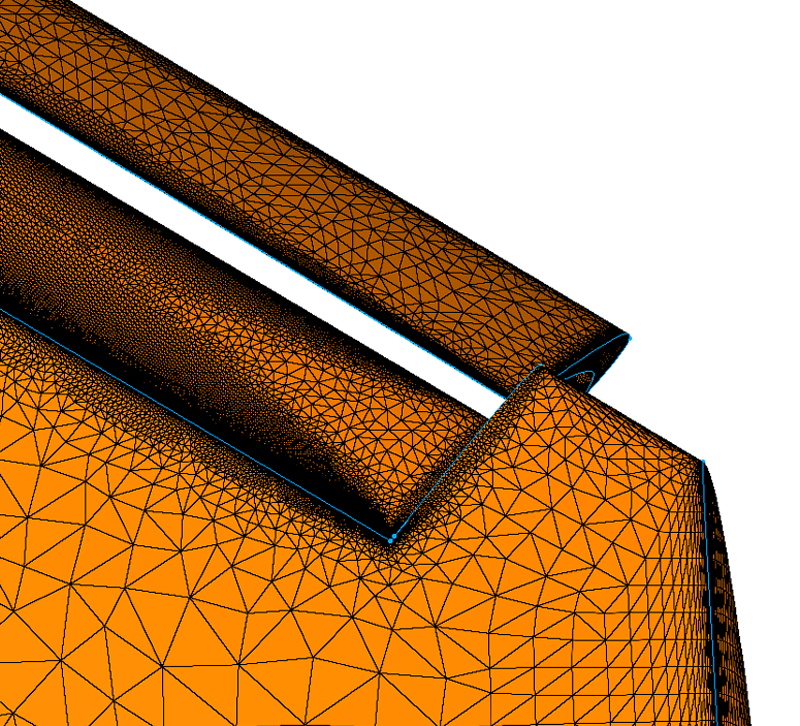 The HL-CRM geometry was imported into Pointwise from an IGES file. The first step in preparing the geometry for meshing was to assemble it into watertight solid models; one each for the fuselage and wing, flaps, and slat. The result of that operation is illustrated in Figure 2. 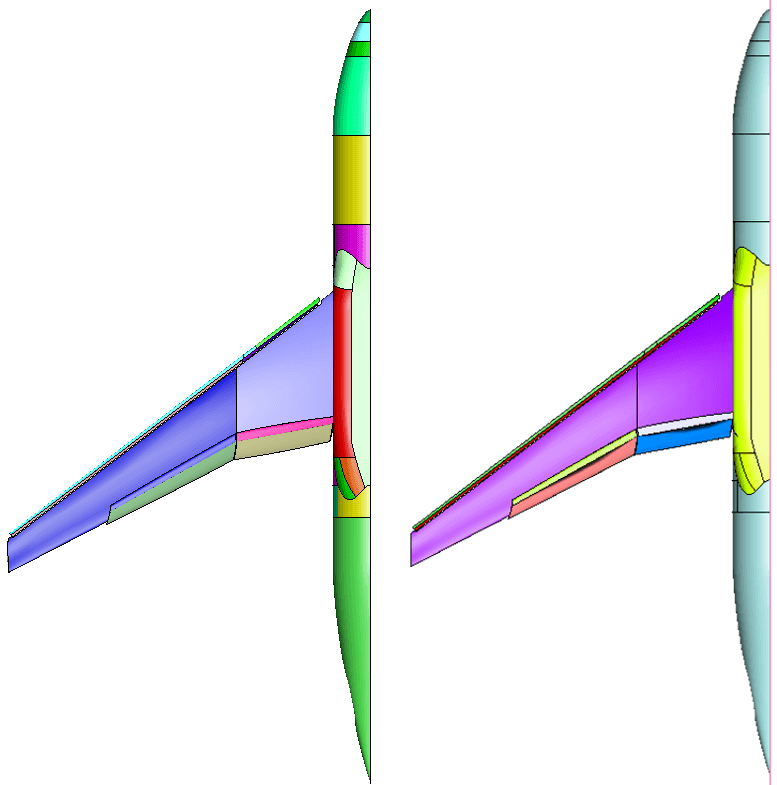 Figure 2: Solid models of the wing-body (magenta), leading edge slat (dark green), and inboard (blue) and outboard (light green) flaps were assembled from the imported geometry. Further geometry preparation involved assembling surface geometry within the solid models into quilts: regions that will be meshed with a single surface mesh. Quilting results in a mesh topology that is vastly simpler than the underlying geometry model topology. Quilt assembly was based on identifying regions where additional surface meshing control was required and/or where geometric feature lines existed. Before and after illustrations of the quilt topology as viewed from below are shown in Figure 3. Figure 3: The HL-CRM geometry (viewed from below) is shaded to represent the topology of the geometry model before quilting (left) and after quilting (right). Generate families of meshes (i.e. meshes of coarse, medium, fine, and extra-fine resolution) that would allow for a grid convergence study by the HLPW. Develop a thorough understanding of how the HLPW gridding e guidelines and the meshing techniques affected the ability and level of effort required to generate a mesh for GMGW. Some of the meshing guidelines provided by HLPW are as follows. The farfield boundary should be 100 reference chords (CREF) distant. Surface cell sizes near the nose and tail should be 1.0 percent CREF. The chordwise spacing at the leading and trailing edges should be 0.1 percent of the local device chord. Spanwise spacing at the root and tips should be 0.1 percent of the semi-span. Cells across the trailing edge (TE) should vary by mesh resolution. The coarse, medium, fine, and extra-fine meshes are expected to have 4, 8, 12, and 16 cells, respectively. 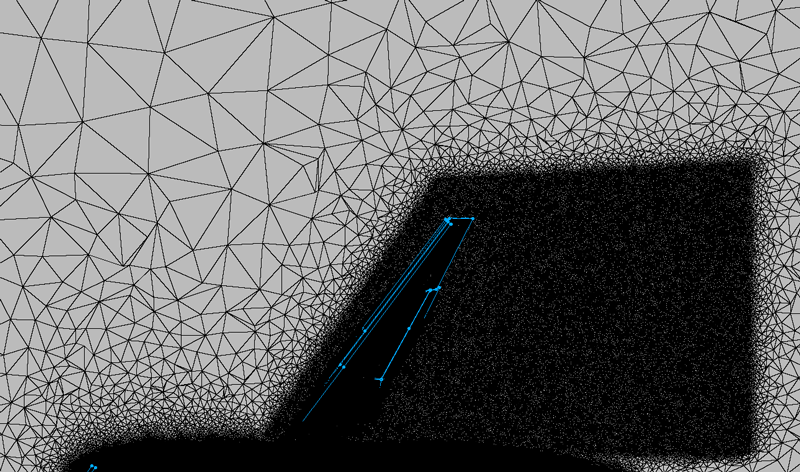 Volume meshes should have at least 2 layers of constant cell spacing normal to aircraft surfaces. The y+ value at the walls vary for each mesh level as well: 1, 2/3, 4/9, and 8/27 for coarse, medium, fine, and extra-fine respectively. Extra refinement in the off-body wake regions is desired with flow aligned cells, if possible. 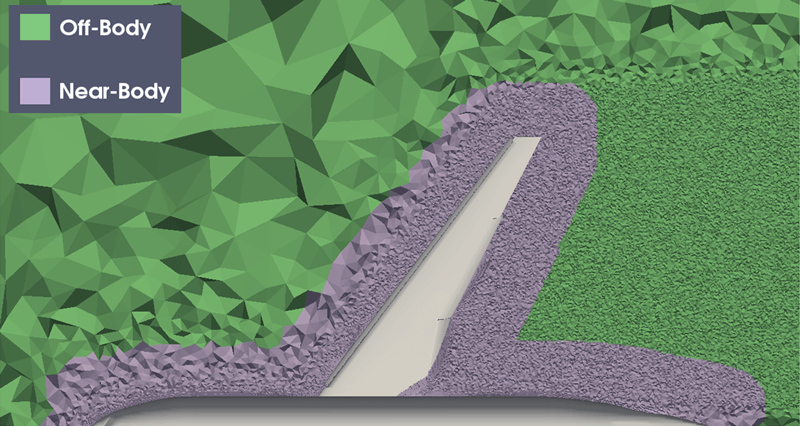 Creation of an initial triangular surface mesh was performed using an automated tool within Pointwise, based on an average equilateral edge length of 1 percent of CREF. Additionally, structured quadrilateral surface meshes were generated and diagonalized to create eight consistent triangular cells across the TE, down the entire span of each element. Modifications were made to spanwise spacings at the root and tip, as well as chordwise spacings at the leading and trailing edges of each element to comply with the gridding guidelines. A review of the surface mesh quality, after application of the gridding guidelines, focused first on cell area ratios. 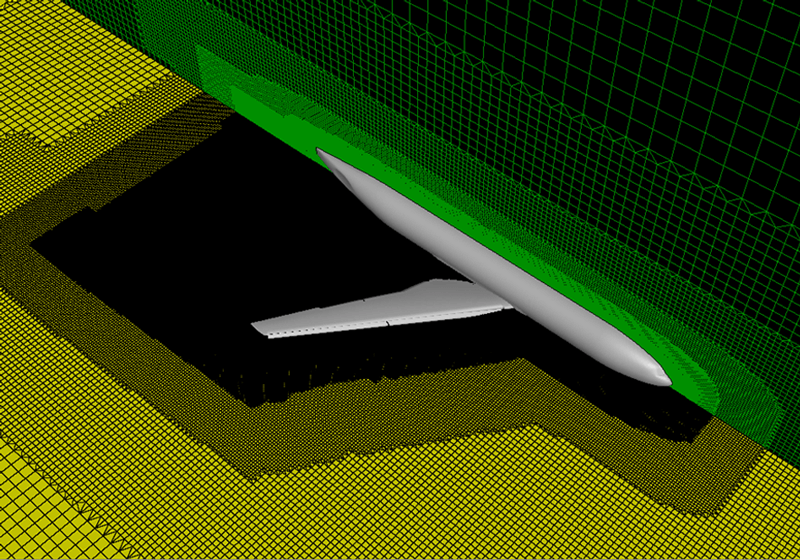 The highest area ratio cells occurred in the slat tip, the outboard region of the wing under slat surface (WUSS), and near all trailing edges. In the slat tip and outboard WUSS regions, the high area ratios were due to coarse surface meshes. Refining the discretization of the slat tip and outboard WUSS to a lower average equilateral edge length of 0.75 reduced the area ratios to reasonable levels. In the TE regions, the high area ratios were due to the presence of isotropic triangles neighboring the anisotropic triangles on the thin TE. Resolving the high area ratios at the TE required the use of anisotropic triangles on the upper and lower surface meshes adjacent to the trailing edge. Additionally, the spacings of these cells had to match the constant cell spacing across the TE to reduce the creation of large cell size jumps in volume cells grown off the TE. As the mesh levels (and the number of cells required across the TE) increased, the chordwise spacings would have to be adjusted to match accordingly. This deviation from the gridding guidelines was found to be one of the most significant factors that affected overall mesh quality, both in the surface mesh and in the resulting volume mesh. Further work was required at the tip of the wing to rectify a large area ratio from the TE to the wing tip surface mesh. By reducing the spanwise spacing on the wing from the guidelines value of 1.0367 to 0.1, the area ratio at the tip was reduced from 54 to approximately 5 as seen in Figure 4. Figure 4: A comparison of cell area ratios at the wing tip trailing edge with the recommended spanwise spacing (left) and with a reduced spacing (right) is shown. The wing root TE also suffered from similar high area ratios, with the spanwise spacings recommended by the gridding guidelines. Area ratios of up to 38.6 were found at the wing-fuselage junction; this high a value would introduce large cell size jumps in volume cells grown off this area. 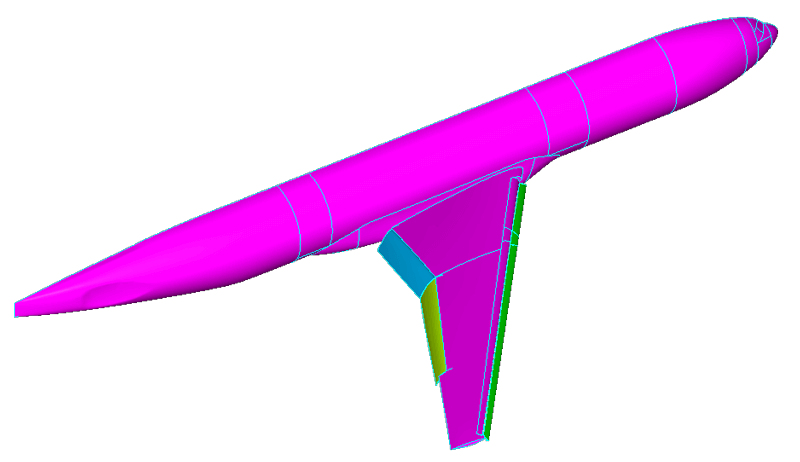 By reducing the spanwise spacing from 1.0367 to 0.1, the maximum area ratio at the wing-fuselage junction was reduced to approximately 3. Due to comparable issues with high area ratio cells at the root and tip of the slat TE, its spanwise spacings were also reduced to 0.1 to improve the quality of these transitional regions. A review of the maximum included angles of the surface meshes identified significant skewness where the WUSS connected to the wing surface. This is exemplified by the outboard portions of the slat and WUSS in Figure 5. 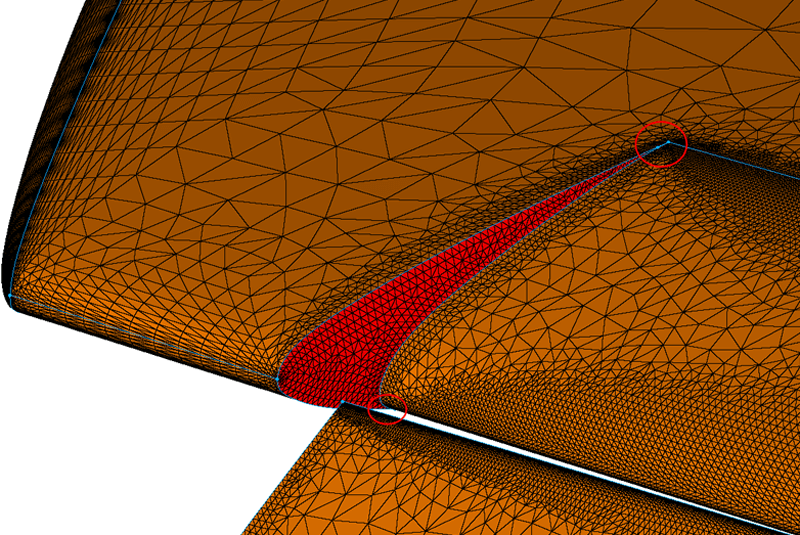 Figure 5: Nearly tangent feature lines in the geometry model resulted in nearly tangent mesh lines (see circles) near the wing tip which posed mesh quality challenges. In these regions, the bounding curves for three surface meshes were almost tangent (1.17 degrees). In addition to the geometrical angle limitation, the initial surface mesh the spacings at these locations did not match, resulting in highly skewed cells (in excess of 173 degrees). To resolve this issue, the spacings in both the chordwise and spanwise direction at this juncture had to be assigned to the same value. In the WUSS-wing junction, an additional quality issue arose because the cells had an area ratio near 100. This, like the small included angle, was considered a geometrical limitation as refining the mesh to reduce the area ratio to reasonable levels would produce a mesh that would be impractical in size. High surface mesh area ratios can translate into high volume ratios in the anisotropic boundary layer region, which can be undesirable to some CFD solvers. In this case, the high area ratios in the corner did translate into volume cell size ratios of over 100, once anisotropic tetrahedra were marched off the surface for the boundary layer mesh. Once surface mesh quality and adherence to surface meshing guidelines were met, a comparison of surface meshes across gap regions was performed. The boundary layer volume mesh is a product of the T-Rex anisotropic meshing algorithm which advances points layers off the surface mesh. In order to maintain volume mesh quality where advancing layers approach each other, the mesh on approaching fronts must be of similar density. Therefore, the surface meshes should be comparable as well. There were several gaps which could potentially be problematic: inboard flap-fuselage gap, inboard-outboard flap gap, flap leading edges and the wing over flap surfaces (WOFS), outboard flap-wing gap, and slat trailing edge and WUSS gap. Figure 6: The gap between the slat trailing edge and the WUSS exemplifies the challenging regions in which boundary layer resolving volume meshes must be generated. Different techniques were used in the gaps to improve point and cell matching depending on the situation at hand. 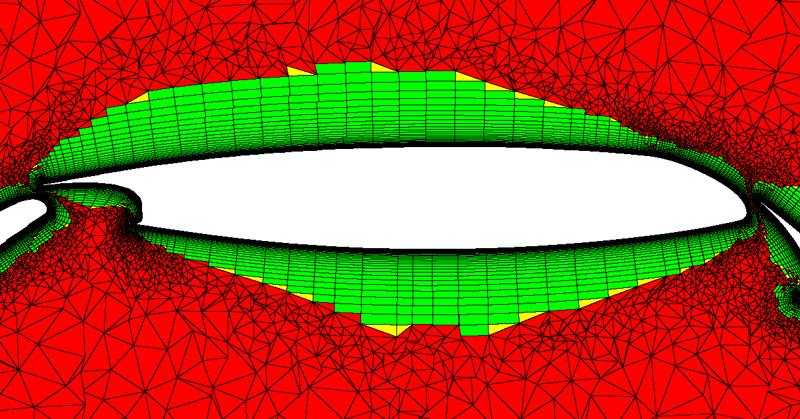 In the inboard flap root and fuselage gap, the flap root surface mesh point distributions were copied and replicated in the fuselage surface mesh directly across the gap. The resulting surface meshes were not identical across the gap but the variation in maximum cell size was less than 7 percent. The inboard flap tip and the outboard flap root surface meshes were similar but not identical in shape. To ensure that the meshes had similar characteristics, the mesh point distributions, the average cell edge lengths, and the maximum allowable cell edge length were matched between the two meshes. The resulting surface meshes had a variation in maximum cell size of approximately 12 percent. This same technique was used to address the outboard flap tip and wing surface meshes. Initial generation of the surface meshes involved growing anisotropic triangles off the leading edge (LE) of each element, with the chordwise spacing specified in the gridding guidelines. The triangular cells were grown with a growth rate of 30 percent, and then compared to the surface mesh across the gap. With these parameters, the surface meshes across the gaps had the largest disparities in shape, orientation, and cell size. Most of the disparity in cell size was due to the number of cells required across the TEs of each element. Because the number of cells across the TEs was a requirement, the most reasonable solution available was to modify how the leading edges of the WUSS and flaps were meshed to reduce the difference in cell size and shape. Anisotropic triangles were grown further in the chordwise direction from the LE of both the WUSS and the flaps by reducing their growth rate to 5 percent. This created layers of cells that were the same shape (anisotropic triangles) of the TE cells and were closer in average cell size. In the case of the slat TE and the WUSS, their gap surface meshes' average cell size difference was reduced from a factor of 70 to 18. A cell size difference of 18x was not ideal but was felt to be sufficient for the simulation. Similar results were seen for the wing TE and flap LE surface mesh modifications. Once the surface mesh modifications were complete, the T-Rex meshing algorithm was used to generate layers of tetrahedra based on several key parameters. All HL-CRM surface meshes were selected to grow anisotropic layers of tetrahedra in the boundary layer with an initial wall spacing of 0.00117. 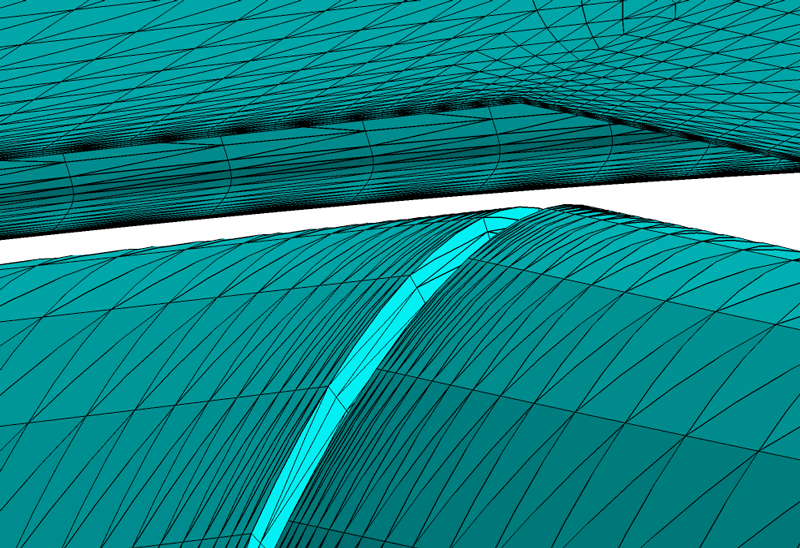 The gridding guidelines requested two constant layers of cells immediately off the wall in the boundary layer region. The T-Rex technique does not currently have this capability, so instead, a growth rate of 1.16 was applied, starting from the first cell off the wall. Layer advancement stopped locally under a number of conditions including layer collision and mesh quality. A source (Figure 7) was created in a swept rectangular region about the wing, and through the wake region to provide additional isotropic tetrahedral refinement in this area of interest. Figure 7: A source (brown) was created over the wing and through the wake region to provide additional isotropic tetrahedral refinement in the volume mesh. The source shape used a constant cell-sizing throughout the specified shape based on the largest surface cell size on the wing element. The degree of isotropic tetrahedral refinement from the source can be seen in a volumetric mesh cut in Figure 8. Figure 8: A top down view of the HL-CRM illustrates the isotropic tetrahedral refinement from the source. A hybrid mesh was generated by combining anisotropic tetrahedra in the boundary layer into prisms, to produce a hybrid mesh containing prisms, pyramids, and tetrahedra. This work is described in Construction of Prism and Hex Layers from Anisotropic Tetrahedra by Dr. John Steinbrenner (AIAA paper no. 2015-2296). Mesh cuts through the wing are shown in Figure 9, Figure 10, and Figure 11. Figure 9: A cut through the hybrid prism-tetrahedra mesh showing prisms (green), pyramids (yellow), and tetrahedra (red). Figure 10: A cut through the hybrid prism-tetrahedra mesh near the slat showing prisms (green), pyramids (yellow), and tetrahedra (red). Figure 11: A cut through the hybrid prism-tetrahedra mesh near the flap showing prisms (green), pyramids (yellow), and tetrahedral (red). The medium resolution meshes had approximately 28.4 million points for both the unstructured and hybrid mesh types. For the unstructured mesh, this translated to 168,637,521 tetrahedra. The hybrid mesh had 81,190,078 cells (52 percent fewer total cells). Of those cells, 53 percent were prisms created in the boundary layer region, 46.2 percent were tetrahedra in the remainder of the volume mesh, and 0.8 percent were pyramids used to transition from exposed quads on partial prism layers to the tetrahedral volume. A hybrid overset mesh was created starting from the hybrid mesh. The hybrid mesh was segregated into near-body and off-body regions at a user-specified distance from the geometry model. For this example, the near-body mesh was defined to be within a distance of 100 percent of CREF. The near-body and off-body regions of the hybrid mesh are delineated in Figure 12. Figure 12: Near-body (gray) and off-body (green) regions within the hybrid mesh were delineated by a distance of CREF from the geometry. Image made in ParaView. The off-body region of the hybrid mesh was removed and replaced by an automated, hierarchical, unstructured meshing process, termed voxel meshing. The hierarchical meshing process runs in a transformed Cartesian space. Voxel meshing requires minimal user input, consisting of a Cartesian bounding box and the maximum voxel size. Settings for the HL-CRM were a bounding box of 57,000 x 27,500 x 55,000, centered on the geometry model and a maximum voxel size of 2,500. An appropriate overset interpolation stencil, between the near-body hybrid mesh and the off-body voxel mesh, was achieved by prescribing the boundary faces of the near-body mesh as adaptation input to the hierarchical meshing process. Adaptation input faces need not be closed manifold topology, as the hierarchical mesh fills the prescribed Cartesian space. The mesh sizing source (described above) aft of the wing provided further adaptation input. An optional post-processing step converted the hanging-node hierarchical mesh into a fully-connected unstructured mesh of tetrahedra, pyramid, and hexahedra, for use with general unstructured mesh flow solvers. Figure 13: A cut through the off-body hierarchical portion of the hybrid overset mesh illustrating progressive levels of resolution. Overset grid assembly cuts away the portion of the off-body mesh inside the model and computes the stencil for interpolation between meshes. Overset grid assembly for the HL-CRM model was conducted within the Pointwise application through integration with Suggar++, a general purpose overset grid assembly software package. The direct cut approach to hole cutting and overlap minimization capabilities of Suggar++ significantly reduce user interaction in the assembly process. In addition to overset assembly definition, the integrated application allowed for visual inspection of the assembled composite mesh. The overset composite mesh consisted of 51 million cells (80 percent of which are triangular prisms) in the near-body component mesh, and 33 million cells (75 percent of which are hexahedra) in the off-body mesh. Overset assembly marked 14.9 million hole cells inactive and 0.4 million fringe cells for interpolation, resulting in nearly 70 million active cells. Generation of the high-order mesh begins with the hybrid linear mesh, and inserts additional nodes for the desired polynomial degree, curving the elements on the surface to match the shape of the geometry model, and blends that curving smoothly into the volume mesh. Pointwise’s development of this technology was recently described in High Order Mesh Generation at Pointwise. As stated previously, the mesh families generated for the high-order meshes covered the extra-tiny, tiny, coarse, and medium resolution levels. Coarse resolution (degree 3) surface meshes in the region of the inboard-outboard flap gap, the inboard slat, and WUSS are shown in Figure 14 and Figure 15. Figure 14: Coarse resolution, degree 3, surface meshes near the gap between the inboard and outboard flaps. Image made in FieldView. Figure 15: Coarse resolution, degree 3, surface mesh near the inboard section of the slat and WUSS. Image made in FieldView. The specification of the number of points across the trailing edges of the mesh, as well as the spacings required in the chordwise and spanwise direction, produced a surface mesh with undesirably high area ratios. From meshing experience, high area ratios in unstructured and hybrid meshes can lead to high volume ratios, as well as volume cell skewness. 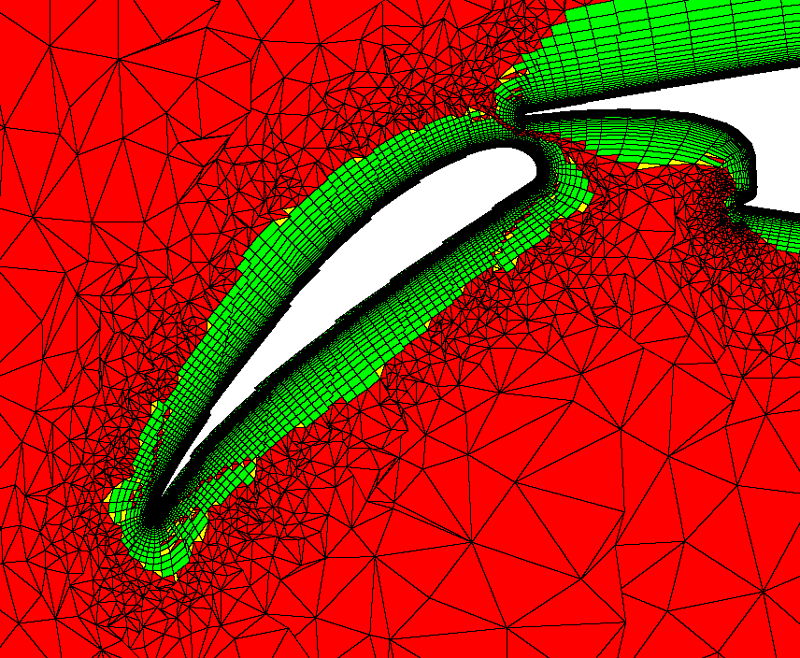 For future gridding guidelines, requiring the number of cells and/or points across the trailing edge should either take precedence over the specification of chordwise and spanwise spacings, or eradicate those requirements completely in an effort to produce smoother meshes, with more reasonable area ratios, at critical features in the geometry. Additionally, treatment of the gap regions for a high-lift configuration containing slats, wing, and flaps posed challenges related to reducing differences in surface meshes across the gaps. 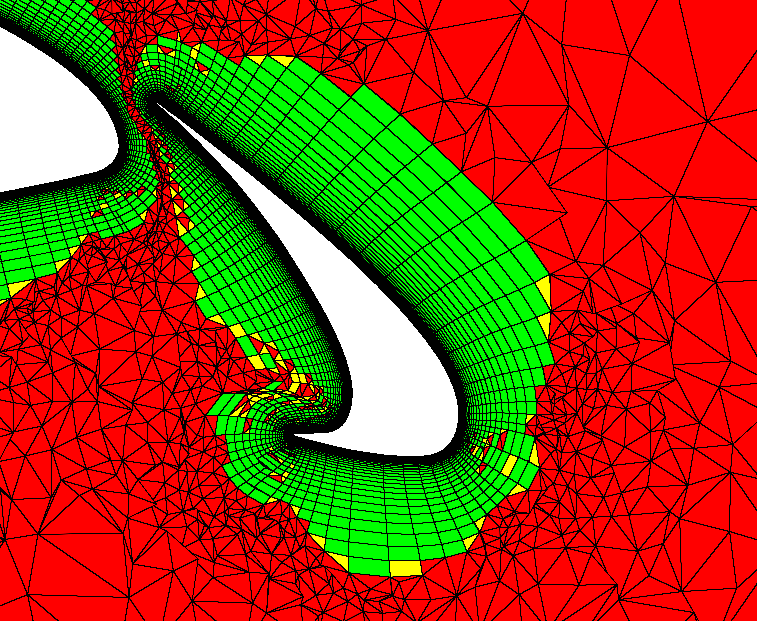 Techniques were applied that resulted in a high-quality mesh in these regions, but more work could be done in the meshing arena to automate this process. Finally, the requirement for two constant layers of cells off the wall in the boundary layer region was not met by these meshes. Further study involving the use of these meshes in simulations for the HLPW is required to determine if the lack of these gridding guidelines requirements affect results with any significance. 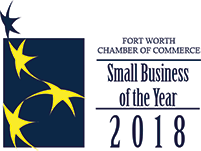 The work described in this article was originally published as Mesh Generation for the NASA High Lift Common Research Model (HL-CRM) by Woeber, Gantt, and Wyman (AIAA paper no. 2017-0363) and presented at AIAA SciTech 2017. All references to third party sources cited above can be found in the referenced paper.